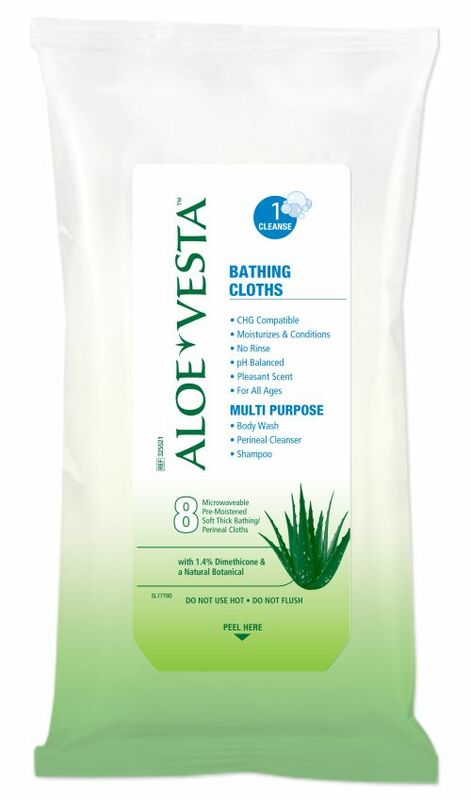 Aloe Vesta® Bathing Cloths are an easy-to-use, rinse-free disposable bathing system that cleanses and moisturizes. 8 towelettes per pack, 24 packs per case. See package for complete instructions. Partially peel back the label and microwave for 30 seconds or less; please remember microwaves vary. To maintain cloth temperature, reseal label. Bath may also be administered at room temperature. DO NOT USE HOT. Test with ungloved hand as gloves may diminish sensitivity to heat. Monitor the heat level closely with infants and unresponsive or skin-sensitive individuals. DO NOT FLUSH.